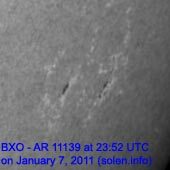 Last major update issued on January 8, 2011 at 01:45 UTC. The geomagnetic field was quiet to active on January 7. 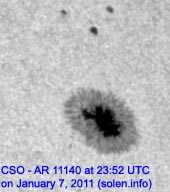 Solar wind speed ranged between 479 and 618 km/s under the influence of a high speed coronal hole stream. 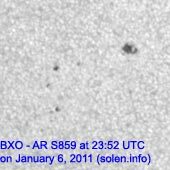 Solar flux measured at 20h UTC on 2.8 GHz was 86.4 (down 0.5 over the last solar rotation). 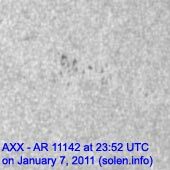 The planetary A index was 11 (STAR Ap - based on the mean of three hour interval ap indices: 11.0). Three hour interval K indices: 42222123 (planetary), 42332222 (Boulder). 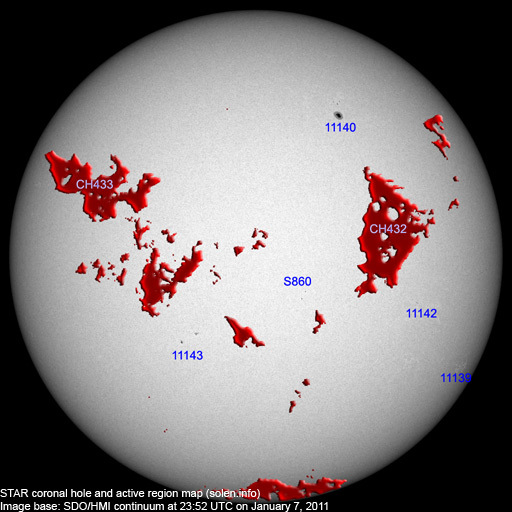 Region 11139 was mostly unchanged and will be rotating out of view at the southwest limb. 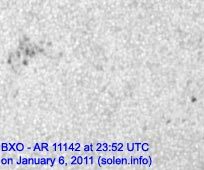 Region 11140 added a few small spots to the north of the single penumbra. Region 11142 lost the leader spots and will likely become spotless today. 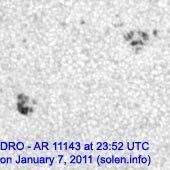 New region 11143 emerged in the southeast quadrant on January 5 and was noticed by NOAA/SWPC two days later. 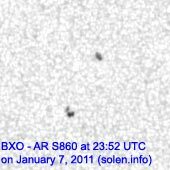 The region added several small spots on January 7. 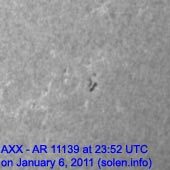 January 5-7: No obviously Earth directed CMEs were observed in LASCO or STEREO images. 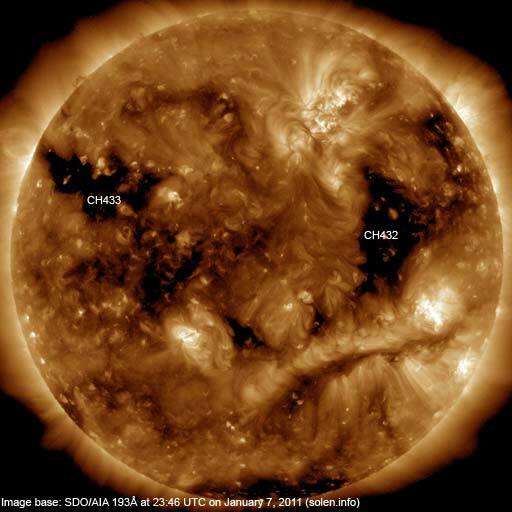 A recurrent trans equatorial coronal hole (CH432) was Earth facing on January 4-5. 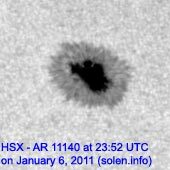 A recurrent coronal hole (CH433) in the northern hemisphere will likely rotate into an Earth facing position on January 9-11. The geomagnetic field is expected to be quiet to unsettled on January 8-9 due to effects from CH432. Mostly quiet conditions are likely on January 10-11.